When the weather is cold, and it's dark outside, soup, salad, and bread is often one of the most welcome dinners you could put on the table. 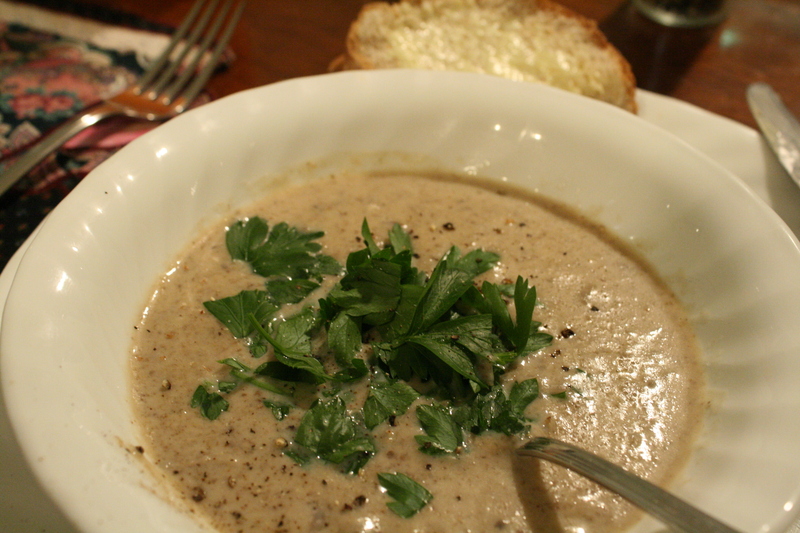 Today we have a gluten-free (or not, if you choose) Mushroom Soup that is creamy and full of flavor, not to mention the fact that it freezes well. Chop the onions. Melt the butter in a large saucepan and cook the onions until transparent. Clean and slice the mushrooms and add to the onions, cooking about 4-5 more minutes. In a separate saucepan, bring broth and milk up to the boil. Meanwhile, add the flour to the mushrooms and onions and cook 2-3 minutes. Season with salt and pepper. When the broth reaches a boil (or almost), gradually add it to the mushrooms and onions, stirring constantly. Bring soup to the boil. Carefully puree the soup in a blender (or use an immersion blender). Taste the soup for seasoning and add as much cream as you like. Garnish with parsley. Yum, I love mushroom soup! I have a local source for mushrooms and he sells a "soup pack." It's just several varieties in a paper bag, but I find mixing up the varieties really adds a lot of interest to the finished dish. Wonderful recipe! Made it tonite. My boyfriend practically licked the bowl! Great paired with a pinot noir.